Our 5/8" Custom Imprinted Dice Featuring your logo printed on one or more sides. Black, Blue, Brown, Green, Red, White, and Yellow. 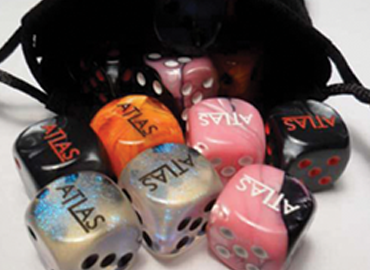 Our 5/8" Custom Board Game Size Dice can feature your logo on any or all sides of the dice. These Transparent Custom Dice are made of a durable urea plastic and come in your choice of Transparent Red or Clear.